You are here : ResearchFarm » Uncategorized » Where Aldi and Lidl go high, Tesco is going low. Where Aldi and Lidl go high, Tesco is going low. Does Tesco’s new discounter Jack’s stand a chance against Aldi and Lidl? Probably not, or at least not in the way Tesco intended. 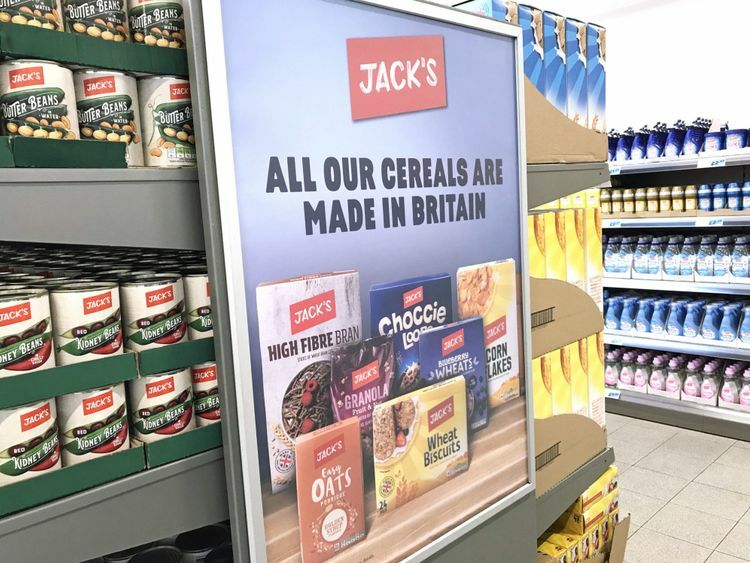 Jack’s looks like a typical misunderstanding of what the German discounters are about, even if imitation is the sincerest form of flattery. Product centric versus shoppers centric retailer. Tesco is well-known for its shopper centric approach using club card. The scheme has enabled the retailer to identify the most valuable shoppers and their favourite products. The retailer will leave these products on its shelves, even if they’re not doing well in sales terms. Tesco does this, because these products tie in the most valuable shopper, who then shop their entire basket at Tesco’s. Aldi and Lidl focus much more on the products they are selling, as the SKU count is so much lower at a discounter. Furthermore the majority of products sold at the discounters is private label. And, a low price proposition coupled with an EDLP policy (at least for now) needs to have strong quality credentials. This means that Aldi products often set the bar in terms of price quality ratios. Many manufacturers notice the difference, when dealing with the two types of retailer. The discounters will focus on product quality, logistics processes (especially the ability to guarantee volume on time) and packaging. Price enters the negotiation almost as an afterthought, but of course it has to be very keen. A big multichannel grocer on the other hand is interested first and foremost in the price. There is a lower value tier of the private label range that needs to be serviced. Product quality, packaging design and also logistics processes are not as paramount. Price is all that matters. To shoppers the product will scream cheapness. Surprisingly Tesco’s new discounter Jack is not taking part in club card. In this way the retailer gives up one of its most important tactical advantages. In Austria and Denmark Lidl is now introducing an app based loyalty program. Both Aldi and Lidl are investing heavily into business software (big data, AI, cloud) and system updates to bring the business model into the next century. Much of this is a consequence of the introduction of FMCG A brands. Promotions, pricing promises, advertising, all of this is rethought at the discounters. The discounters are moving upmarket, introducing new, modern, bright and expensive store concepts. They are flexing the model and footprint down to convenience stores, but also up to larger stores accommodating increased SKU ranges and FMCG A brands. This has meant a change of strategy in the UK, where Aldi and Lidl stores had been on poorly performing sites historically. This changed almost 10 years ago, when the discounters realised that they had to invest in real estate in the UK to make their business viable. The various investment sums (in the billions) and new store models are now well known and need no further description. Tesco on the other hand has identified an opportunity in mothballed locations, in areas of low purchasing power that would not support a full size Tesco. Arguably it makes sense to have the stores/sites in operation and create some economic activity. Whether this is going to challenge Aldi or Lidl is a different question. Lidl or rather the Schwarz Group has become the EU’s biggest retailer. Both Aldi businesses (North and South) taken together including its Trader Joe’s operation in the US also have a higher sales turnover than Tesco. The discounters are privately owned and backed by some of the richest families in Germany. Management can take a long-term view and concentrate solely on their one format. All processes have been optimised for decades and are updated continously to reflect the latest thinking. Tesco is publicly traded on the stock exchange. Apart from a certain short term focus forced on the company, management at the retailer also have multiple multichannel businesses to run. In other words where Aldi and Lidl go high, Tesco is going low. That said, this doesn’t mean that Jack’s will be a total failure. On most accounts it looks most likely that further austerity is going to hit British shoppers. This means a hard discount operation is going to stand to benefit from the worsening macro economic background. In this sense Tesco has made the right move. However, we believe the execution is poor. Aldi and Lidl will benefit from the harsher economic climate, just as they did throughout the last recession. They will also win, because they’re updating their offer continuously. The offer is not just about high quality at the lowest price point possible, it is also about modern store environments, FMCG brands, fresh and convenience ranges etc. And all of it operated at massive scale. There are many reasons for this, such as the business not being run on strict discounter principles from supply chain setup to reduction of complexity or failing to create separate buying teams and marketing departments etc. And there is always the fear to cannibalise the exiting proposition. The last point to mention is that in retail of course size matters. With Lidl and also Aldi now gunning for up to 1,000 stores in the UK the couple of store opening mentioned by Tesco will really not make a dent. « A new golden age for CPG? This website and all of its content is © copyrigthed to ResearchFarm. All rights reserved 2018.